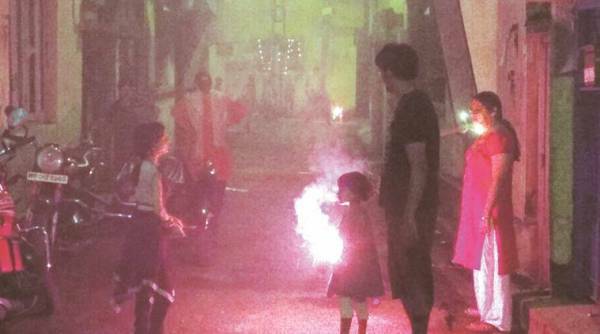 After Delhi air pollution, the air quality in parts of Kolkata dropped to the “very poor” level as people defied the Supreme Court’s order directing that firecrackers be burst only between 8 pm to 10 pm. The website of National Air Quality Index showed that the PM 2.5 count shot up to 330 at the Rabindra Bharati automatic air monitoring station on B T Road, while the count was 373 at the Victoria Memorial monitoring station in central Kolkata at 11 am on Thursday. Any reading between 301 to 400 in AQI is termed as “very poor”. Environmentalist Subhas Dutta said there is a need to create a mass awareness among people to make them realise the dangers of such pollution levels. “It is our failure as environmentalists that we could not make people understand that they should not violate the norms. It is also the failure of the administration that it could not control the situation and stop the 1 per cent people who are accountable for the pollution. We now have to make people aware that such levels of pollution affect human beings and animals. For that, there is a need to engage in a mass awareness programme,” said Dutta. West Bengal Pollution Control Board (WBPCB) chairman Kalyan Rudra was not available for comment. Sources at the WBPCB said they would compile the air quality data of Kolkata till November 14 and submit it to the concerned authority. Environmentalist Naba Dutta blamed the state government for its failure to crackdown on the sale of illegal firecrackers which, according to him, led to the poor air quality in the city.